In early 1942 Camp Seaside was constructed along the Pacific coast just north of the mouth of the Ventura River to protect the Channel Islands area. The Camp Seaside artillery site was comprised of two gun emplacements, barracks and ammunition bunkers. This location was fortified in response to the attack by a Japanese submarine at the Ellwood oilfield on February 23, 1942. Following that attack there was concern that the oil installations further up the Ventura River were at risk. The two large guns were called “Long Toms” and could fire up to a distance of 14 miles. The guns were never fired and were removed in 1944. Ten artillery sites were installed in coastal Southern California during World War II. 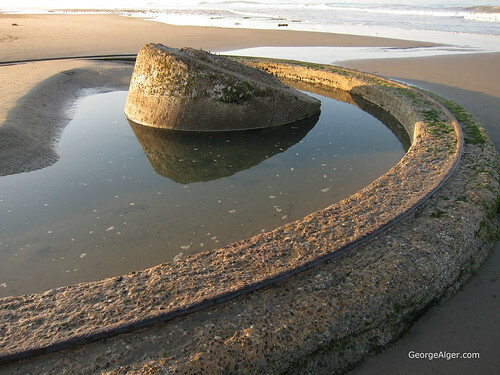 Today it is estimated that remnants remain of only three, including Ventura’s Battery 2. The remnants of this site consist of two 38 foot diameter concrete circles topped with steel rails that allowed the guns to swivel in all directions. This entry was posted in Machines and tagged 2012, beach, CA, historic site, ocean, Pacific, sand, sunrise, Ventura, water, WWII by George Alger. Bookmark the permalink.